This five-bedroom/three-bath home sits on five acres of land in the Kohala Estates. We specifically designed the house as a family vacation gathering spot, and we built it ourselves in 1989. Its high ceilings and 760 square feet of windows make it particularly light and airy. Tradewinds and 13 ceiling fans will help to keep you cool. The kitchen and the master bedroom have 180-degree ocean views. You can also see the Kohala Mountains, Mauna Kea, Hualalai, Maua Loa, and nearly the entire Kona-Kohala Coast. With luck and timing, you can spot Hawaiian spinner dolphins, humpback whales, or the occasional green flash. We can't guarantee blue skies and no mosquitoes; but your odds are better here than anywhere else in the central Pacific. The house sits in the rain shadow of the Kohala Mountains, and annual rainfall totals are typically in the low single digits! We have tried to make our house a comfortable 'home away from home' for our guests. It is attractive and comfortable without being so fancy that guests are afraid to relax. The library boasts plenty of books and movies. Extras: You'll find enough kitchenware and linens to choke a flea market! Kids will enjoy several cubic feet of Legos, building blocks, and other toys. Puzzles and board games abound. Binoculars, beach towels, coolers, beach chairs, boogie boards and hammocks are left out for your use. You won't need to bring much besides your clothes and your camera. Many of our guests consider this 'their' second home; and accordingly, our most popular times can be booked over a year in advance. Fall and late spring usually have the best availability. You will also enjoy a VCR in every bedroom, a satellite TV with Hi-Def in the living room, a phone for making local calls, and WiFi Internet access. Location, Location, Location: Most of our guests appreciate where the house is located. It is in a semi-rural neighborhood, which has no street lights and a myriad of stars at night. Weather is usually warm and dry. Within easy driving distance to the Big Island's premiere beaches and golf courses, it is also conveniently located between Kailua-Kona and Hilo. Good restaurants are only three miles away. Neighboring houses are quite a distance away, and the neighborhood is quiet and safe. Sunsets are beautiful, and some times you will even catch a green flash. Home away from home: The house is very comfortable. Many of our guests say that they feel right at home as soon as they walk in the door. The living room walls are lined with books. Each room has a flat-screen television and a Blu-Ray/DVD player. You may bring your own Blu-rays or DVDs or watch some of the 600 available in the house. The living room has satellite TV. The floor plan allows for privacy as well as communal activities. Most of our guests especially appreciate the wrap-around lanai, which includes 840 square feet facing the ocean. The lanai has four table-and-chair sets, four lounge chairs, and a gas barbecue, which makes it perfect for communal meals or individual relaxing and reading. The driveway is large enough for four vehicles to park comfortably. The house is surrounded with irrigated foliage and flowers, which are especially colorful and beautiful in the spring and summer months. If you are looking for a getaway or a place to get-together, you will find that Hale Kephart fills the bill. Don grew up in California, earned his B.S. and M.S. from Stanford University, and his PhD in biology from the University of Chicago. Kerrill moved to California from Michigan. She earned a B.A. from Eastern Michigan University and an M.A. in English literature from California State University in Long Beach. We both finished our teaching careers at Long Beach Polytechnic High School, where we were able to teach the subjects we loved to students who made us laugh and think every day we spent with them. We built Hale Kephart in 1989 during nine weeks of our summer vacation with the help of family and friends. We enjoyed staying in the house during spring, winter, and summer breaks for 14 years. Then we retired and built our current residence on the same five acres as the vacation rental and thus began another chapter in our lives. Hawaii is our home now, and we cannot imagine wanting to live anywhere else. We love the climate, the dark and quiet nights, the fresh air, the ever-changing views of ocean, mountains, and sky. We have embraced the aloha spirit and the whole concept of ohana. We also love the people. We have made friends from many walks of life; each one of them has enriched in our lives in some meaningful way. Some of them have been guests at our vacation rental who kept coming back until our relationship metamorphosed into a deep friendship. Others we met while writing articles for the local newspaper or playing tennis at Mauna Kea's Seaside Tennis Club. Most we met through other friends. Our lives have developed a rhythm to them that is both interesting and comfortable. Every year we take at least one trip to the mainland to touch bases with friends and family. Almost every other year we take a longer trip. We have enjoyed sojourns in Alaska, Australia, New England, Washington D.C, New Zealand, Micronesia, and the Pacific Northwest. We have seen spectacular places and had breathtaking experiences, but we are always glad to come home. Our son taught high-school mathematics for a year in Kona. We came out during spring break to see him and to see the Big Island--the only major Hawaiian island we had not visited. We fell in love with the spaciousness and the diversity of the island and kept finding ourselves drawn to Hapuna Beach, which is six miles south of us. A few years later we came back and stayed at Puako. We began looking for property. Kerrill kept coming back to a windswept, almost barren piece of land on a hillside in the Kohala Estates. Don finally said, "If you can find anything green on that lot, I'll consider buying it with you." We are not sure that we ever did find anything green--only sere buffle grass and dead kiawe trees. But we kept coming back because the view was better than anywhere else we had looked. And, finally, the land spoke to Don, too, and we put in an offer. Our offer was refused because someone else offered more money--in cash. It turned out he didn't really have the cash, so he agreed to sell us five of the nine acres if we would float him a second mortgage so that he could come up with the money on the day escrow closed. We both knew the owner would come to realize that his asking price was below market and we might not be able to afford what it was really worth. So we loaned him the money, and right after escrow closed for him, he sold us the bottom five acres. We've never regretted it. We enjoyed the vacation rental for 14 years and then built our retirement home behind it on the same lot. When we are not traveling or maintaining the property, we enjoy reading and writing--we have a library of close to 12,000 books. Don does woodworking, builds model wooden ships, makes and shoots off rockets, hunts feral goats and pigs, makes knives, and enjoys photography. Kerrill enjoys tennis and gardening. We both like to take out our Boston Whaler, especially when the humpbacks are here. The unique benefits are self-explanatory to anyone who has visited our property. It enjoys an ideal location and an especially beautiful view. It is in a quiet neighborhood, one that so far has been so safe that most of our neighbors don't bother to lock their homes and cars. Besides, where else can you watch whales breaching against the backdrop of a full-sky sunset from your own front porch? When we return to the mainland--as much as we enjoy seeing family and friends and taking in some of what it has to offer (theater, museums, specialty stores, national parks, restaurants, swap meets, etc.) --we soon become a little homesick. We especially appreciate the lower population density here. A traffic jam here would be considered a mild slowdown in most parts of Southern California. When we are away we find ourselves missing the raucous calls of the gray francolins in the mornings, the trade winds blowing (sometimes gusting) through our palm trees and making their clattering fronds sound like falling rain, the panoramic and ever-changing vista that our eyes drink in as we look in any direction. We miss the fragrance of plumerias and gardenias, the bright and gaudy colors of the hibiscus and plumbagos and poincianas. We miss the fresh and soft air. We even miss the physical labor that it takes to keep up two houses and five acres of land. We like to think that we have been here long enough now to consider ourselves kama'aina even though we weren't born here. Bathrooms are also well-ventilated with windows and ceiling fans. Ocean is less than one-half mile away. House is perched on a hill at about 300 feet above sea level. View encompasses the Kohala coast from just north of Kona Airport to just south of Upulu Airport. Mauna Kea, Mauna Loa, Hualahai, and the Kohala Mountains are all visible from the lanai. In the winter months, Mauna Kea and Mauna Loa are often blanketed with snow. Unit has a sweeping view of Kona and Kohala coasts and three volcanic mountains. Close-up whale-watching in the winter from the front lanai. Spectacular sunsets and green flashes over the water. Washer is extra-sized and in the unit. The living room features four chairs, a couch, several tables, a flat-screen Hi-Def TV that is on the satellite, and a book case full of books and DVDs. It has an ocean view and opens onto the lanai. (2) One refrigerator is full-sized, and the other is bar-sized for keeping drinks cold. Stove is electric with two large and two small burners. (1) Microwave is on the counter top. There are at least two coffee makers at the rental at all times. Toaster holds four pieces of bread and is easy to clean. The pantry includes paper towels, wastebasket liners, refrigerator bags, spices, and a random assortment of products that other guests have left behind. There are plenty of dishes and utensils for large groups. Fourteen people can eat at the two tables in the house. Over 20 people can eat at the four tables on the front lanai. Hi-Def Satellite TV is in the living room. DVD library has well over 100 titles. The house is landscaped with palms and flowering plants. Check with the owners if you need snorkel gear. Boogie boards and swim noodles are provided. Public courts are in Kapa'au and Waimea. Private courts are at the hotels. Closest public course is in Waikaloa, and closest private ones are at the hotels just south of us. Also Kapa'au and Honoka'a both have 9-hole courses that are inexpensive and good for beginners. Kitchen has more than enough dishes, glassware, flatware, cooking utensils, cutlery, and linens to host a large party. It also has a bar-sized refrigerator as well as a full-sized refrigerator with freezer and ice-maker. It has almost any small appliance you would want to use on a vacation as well as two microwave ovens. The front lanai is 84' x 10' feet and has three tables, 14 chairs, a couple of hammocks, and a barbecue. It also has a beautiful ocean view, which is visible also from the living room, kitchen, and master bedroom. The house is well stocked and roomy. Family meals on the lanai & watching the sunset were highlights. The house was roomy & comfortable for our large group and came with everything needed. Don & Kerrill are kind and generous hosts. Tom and his family were ideal guests. They were very patient when the stove failed and we had to replace it. We are always happy to have guests like them. My family of 12 loved the house and the location. Very large comfortable home with a wraparound lanai works well for a large crowd. We had one rain day and took advantage of the board games that the owner provided for a family game day. I can’t really think of any negatives. I would like to stay again with a couple of good books and no family - very relaxing location. Great view and very quiet. Most restful vacation I’ve had in a long time. You have to love guests who can make lemonade (family board-day game) out of lemons (rainy, blustery days). We hope Ron and a couple of good books finds some time to make a return trip. From the description I was worried this place was "too good to be true" - but it turned out to be every bit as great as it seemed. We had a large group (16 people), and still had more than enough room - many of us slept out on the lanai. Great location, great views, great hosts. Will definitely be coming back! These sixteen people--most of them college students--turned out to be perfect guests--respectful of the house and of the neighborhood. We will be more than happy to host a group like this again. The huge breezy lanai was the highlight for our group of wedding guests. We saw humpback whales spouting off the coast. All bedrooms are set up adjacent to a bathroom, two sets of bedroom-bathroom-bedroom, plus the master with en-suite bath for the fifth bedroom. Lots of pullout sofas if your group is larger. The owners are nearby, but unseen unless you call, and lovely as can be. This is a great choice. We would love to have guests like Brent and his group all of the time. They were here for a wedding at nearby Kahua Ranch, and they were happy, respectful, and appreciative. We hope they will come back for a longer stay in the future. This was an amazing place which accommodated ten of us with no problem. It is very well furnished and has everything you would need. It is a little bit out of the way, so if you are doing a lot of activities in Kona you will be driving back and forth quite a bit. There is a great deal of local flavor close to the house. Everything was as advertised. Don and Kerrill were amazing to work with prior to the trip, during and afterwards. They are great honest people. If you are planning a vacation with a large group of people this house should be on the top of your list!!! The house is located on the Kohala Coast just three miles north of Kawaihae: The scenery is breathtaking---five volcanoes in view plus the Kona Coast to the south and the Kohala Coast to the north. The climate is nearly perfect--warm and breezy and dry. Snorkeling is wonderful along the Kohala coast because a coral reef extends out several hundred feet. You can watch the humpbacks breach and blow right from the roadside or the lanai during the winter months. Several premiere golf courses, beaches, and restaurants are within a short drive. The night sky is a gorgeous star scape. The rugged Kohala coast is a spectacular example of Hawaii as it was before it became so developed in other areas. 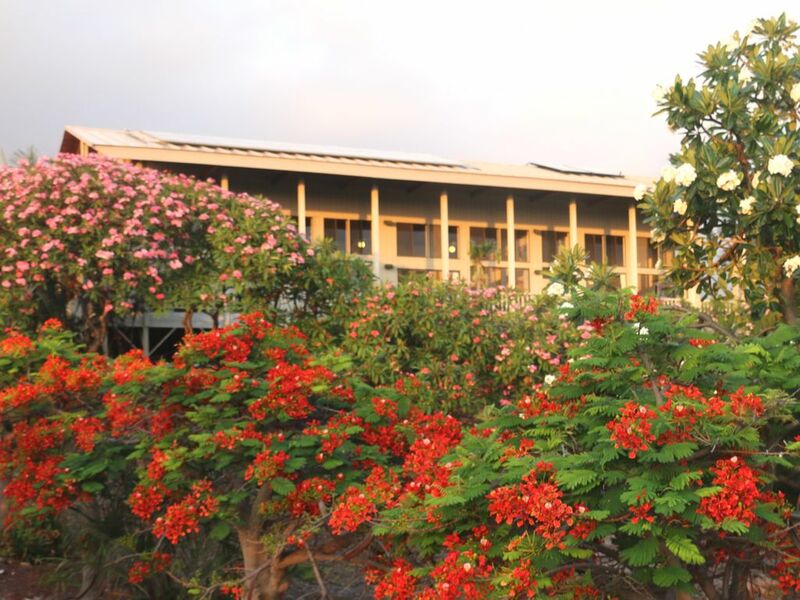 Hale Kephart is ideally located--45 minutes from Kailua-Kona, 20 minutes from Waimea (Kamuela), 20 minutes from Hawi and Kapa'au, 90 minutes from Hilo, and 120 minutes from Volcanoes National Park. In Kawaihae, there are several restaurants and two shave-ice vendors. Da Fish House sells fresh fish from local catches of the day. Kawaihae also has a dive shop and dive boat, a charter fishing boat, and a whale-watching or dolphin-watching boat that also offers sunset cruises. Two helicopter-tour companies are only six and twelve miles away. Fixed-wing tours are available at Kailua-Kona Airport. We ask for a booking deposit of 25% of the total of the basic rent to reserve the property. The balance of the rent plus the taxes and cleaning/security deposit are due 30 days before arrival. If you cancel, we will retain the booking deposit unless we are able to re-rent the house.